Building a Customer Journey Map (CJM) is used to help represent the way customer passes in his relationship with a certain branded products or services. A visual representation of an experience, customers have with a business helps marketers analyze the story of a relationship between businesses from a primary contact to long-time relations. This sample diagram was created using the Customer Journey Mapping Solution for ConceptDraw DIAGRAM. It includes 7 libraries containing 219 vector scalable objects that support many professional ways for making the most effective representing customer journey for different business situations. Reveal the Customer Journey Mapping in the Solutions panel. Open the proper CJM library. Add objects to the diagram by dragging them from the library to the document page. Organize objects using the Arrange&Size side panel along with Snap&Glue tools. Use the predefined style for the heading — just select the Title tool, place the text-box in the appropriate part of the drawing and start typing. Add text to the customer journey map — simply select objects by one and enter the text. In order to quickly format a drawing, we recommend using the built-in formatting styles. Discover the Styles section in the Format panel. Result:This sample drawing was developed using the Customer Journey Mapping Solution for ConceptDraw DIAGRAM. 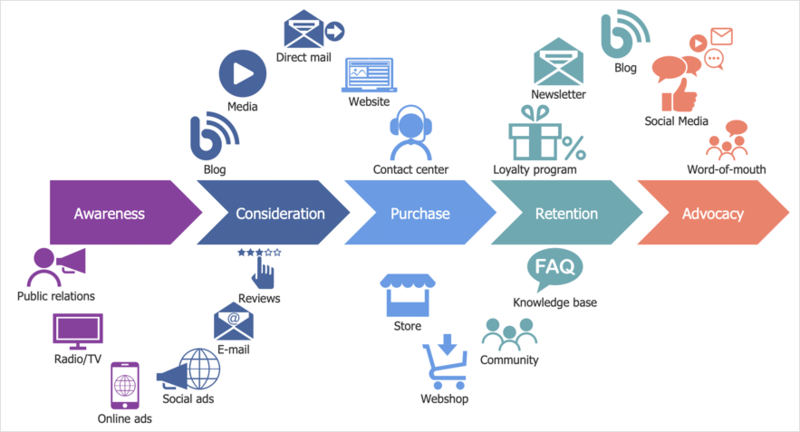 It based on the customer journey with touchpoints English.png from the Wikimedia Commons.